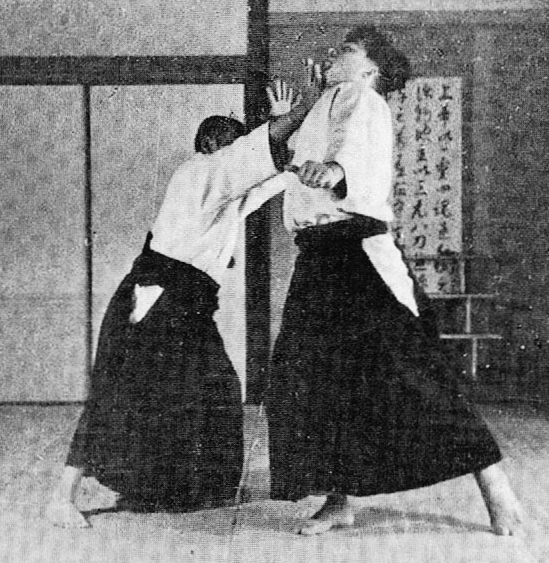 Tsuki zenpo nage is one of those techniques that for years had me baffled as to how it had any martial relevance at all. 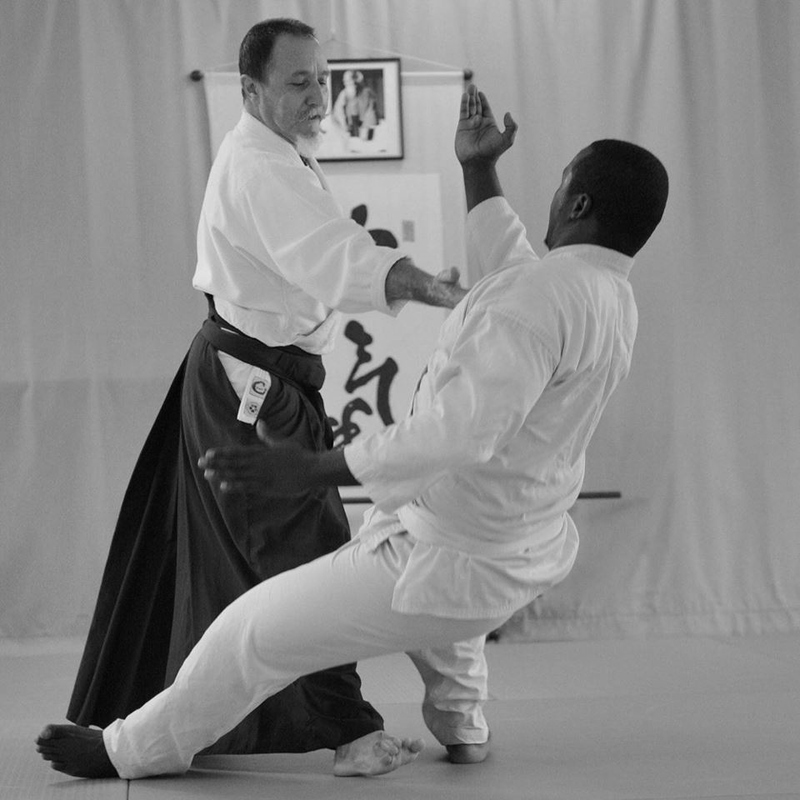 For those not familiar with the technique, it is more commonly seen in ki aikido dojos and basically involves the nage stepping to the side of a strike to the stomach, taking the uke’s arm and projecting them off. 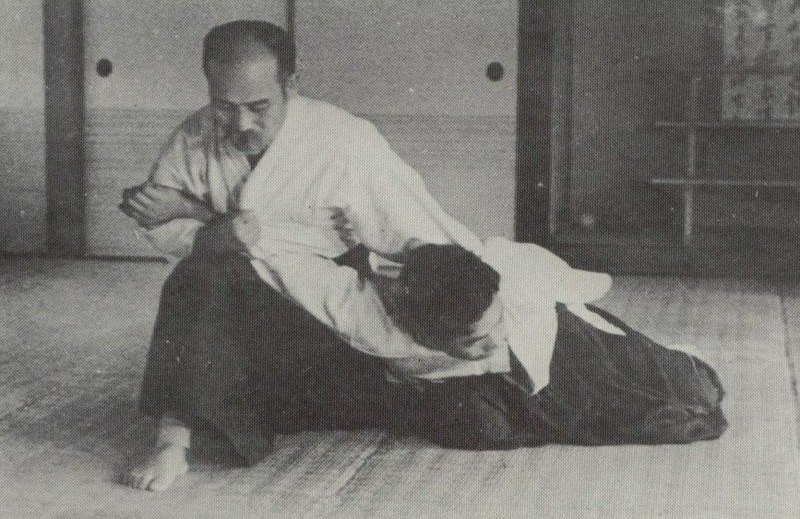 The idea that a strike or thrust by a uke to a nage’s abdomen could ever result in the uke being able to be projected forward into an unavoidable roll-out in this manner always seem far fetched to me. Further, I had never had anyone actually be able to do it to me without my full cooperation. 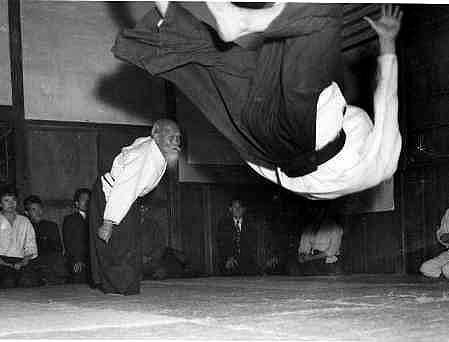 In the end I began to see the technique as nothing more than a rolling exercise. Recently I came across a black and white video recorded sometime in the 90’s that included a range of hiji waza (elbow techniques). 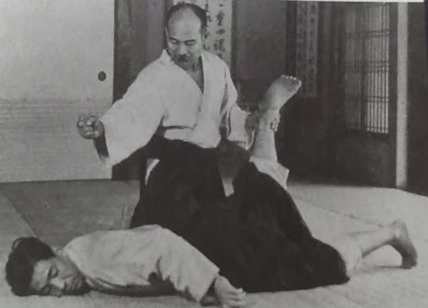 To my surprise I recognised a hiji waza technique that was clearly tsuki zenpo nage in its martial form – Tsuki hiji nage. So how did it differ? Firstly the nage commenced the technique with a double strike to the uke’s abdomen and temple to break the uke’s balance at first instance (see photo of O’sensei at right). This then easily segued into a locking of the elbow joint which in turn enabled the nage to continue to take the uke’s balance and then project them forward into an unavoidable roll. Any other response by the uke (eg resisting the roll out) would risk serious elbow damage. 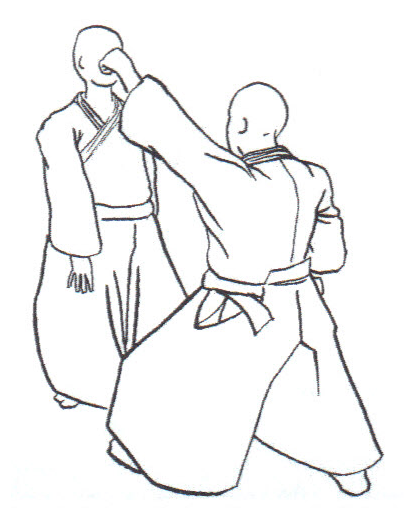 Notably in the more typical Tsuki zenpo nage the elbow locking, as well as the atemi, was completely omitted. Unfortunately, what has happened here is an example of an Aikido application being watered down (presumably for safety or philosophical reasons) to the point it had become martially irrelevant. 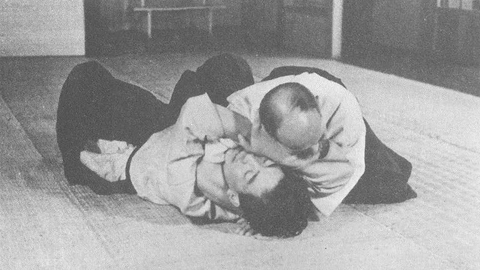 By removing the atemi (strike) and the elbow lock, the essence of the technique had become completely lost turning it into no more than an aided rolling or blending exercise. 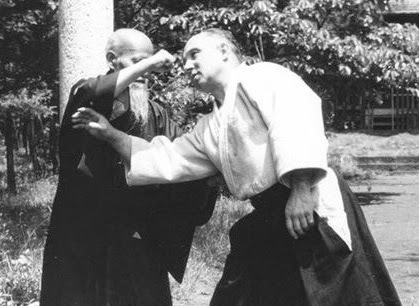 Far more concerning, however, is that many of the Aiki principles underpinning the technique (you know what we are actually supposed to be learning) had been completely stripped from its application. 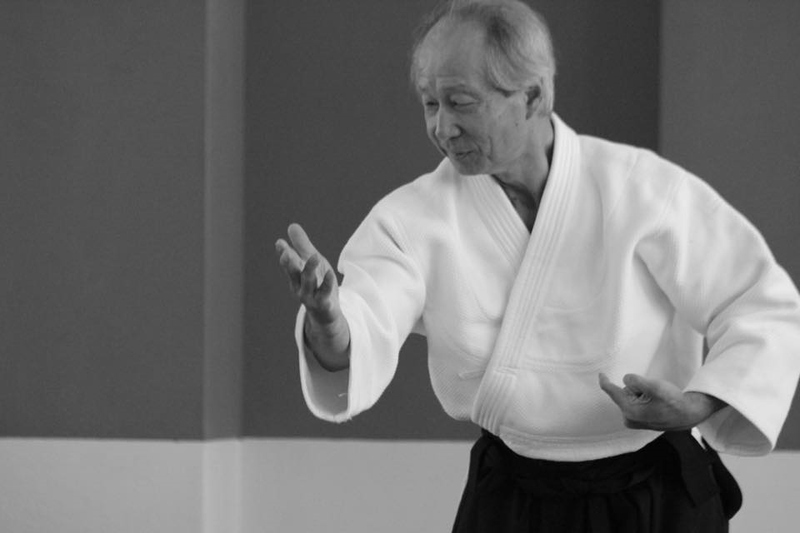 These include balance breaking, entering while moving off-line, “heaven-man-earth”, and nage/uke sensitivity and connection, and ukemi responses from an off-balanced position. 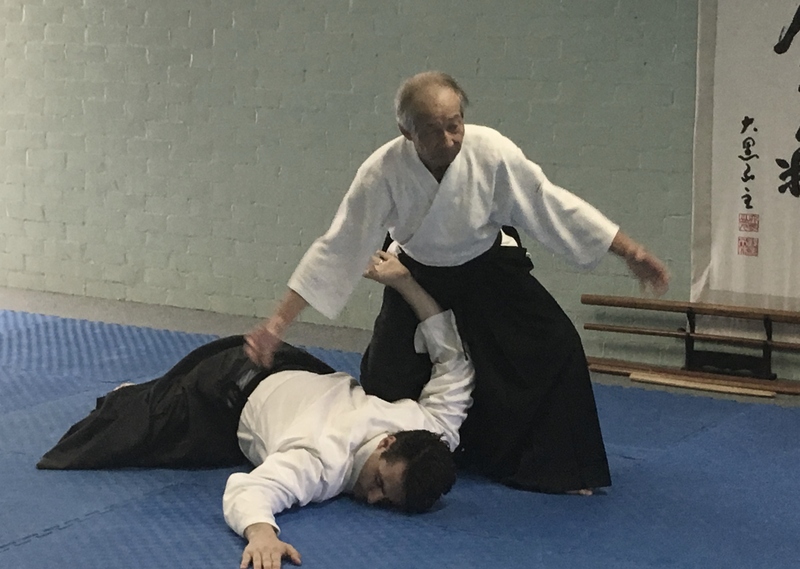 In the below video seniors from our dojo can be seen practising Tsuki zenpo nage with the atemi and elbow lock included in the application. In some instances, the nage also takes the added precaution of üsing their hip to provide added assurance that kuzushi (balance breaking) is maintained throughout. 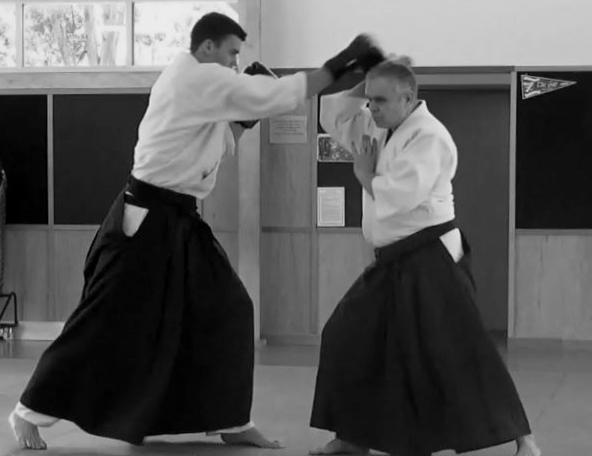 In the below video Chicko Xerri Sensei explores the Aiki principles underpinning a yokomen strike or cut in Aikido practice. 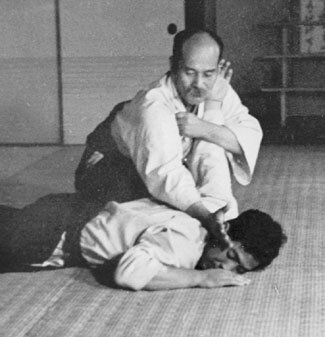 Yokomen is described in the Founders 2nd text, Budo (1938), as a “blow to the side of your partner’s head or down diagonally across (their) shoulder with your te-gatana (hand sword)”. 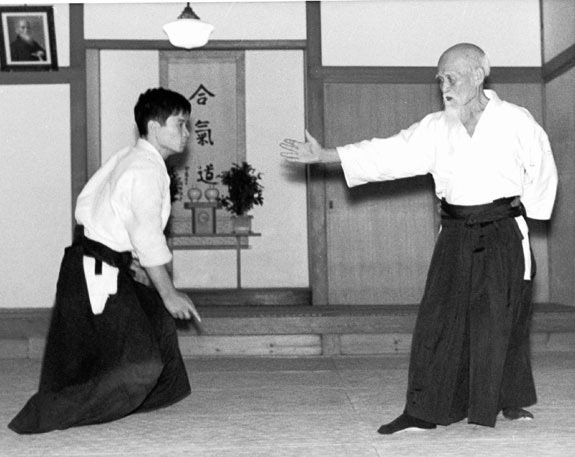 The importance of yokomen training in Aikido is also discussed in the text. Of particular note is the statement that training in yokomen attacks “…contains the essence of all techniques“.